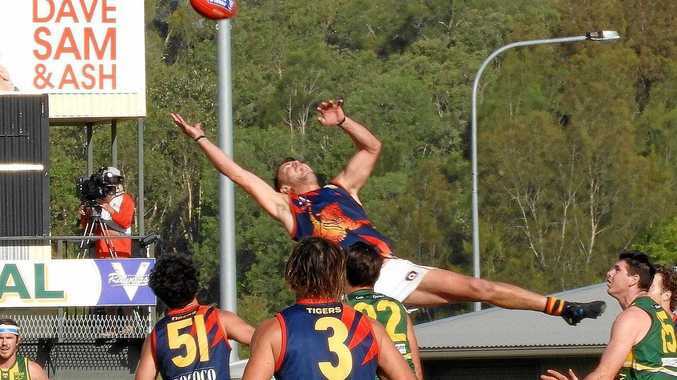 AUSSIE RULES: Despite playing second fiddle to minor premiers Maroochydore for much of the year, the Noosa Tigers have made a statement by progressing direct to the grand final with a dominant display over their Coast rivals. The two competition heavyweights clashed in the major semi-final on Saturday, with Noosa overcoming the Roos in their territory for an upset 20.12.132 to 18.13.121 victory. Despite the 11 point margin at full-time, it was one-way traffic for much of the match with the Tigers dominating each of the first three quarters. They even held a 57 point lead heading into the final stanza. Despite the Roos mounting a comeback, it was too little too late, with the Fisherman's Road outfit now forced to battle Caloundra Panthers next week in the preliminary final for a second chance at making the decider. "We put a big emphasis during the week to make sure we came out and made a statement and I felt in the first quarter we played some really consistent football which gave us a good lead to start with,” Noosa coach Sam Faure said. Despite the loss, Maroochydore Roos attacking force Mitchell Scholard believes there was plenty to gain.